At the March meeting of Metropolitan Water District’s Water Planning and Stewardship Committee, Bay Delta Initiatives Manager Steve Arakawa walked committee members through the recent framework for the voluntary agreement that is being proposed as an alternative to the State Water Board’s update to the Bay Delta Water Quality Control Plan. 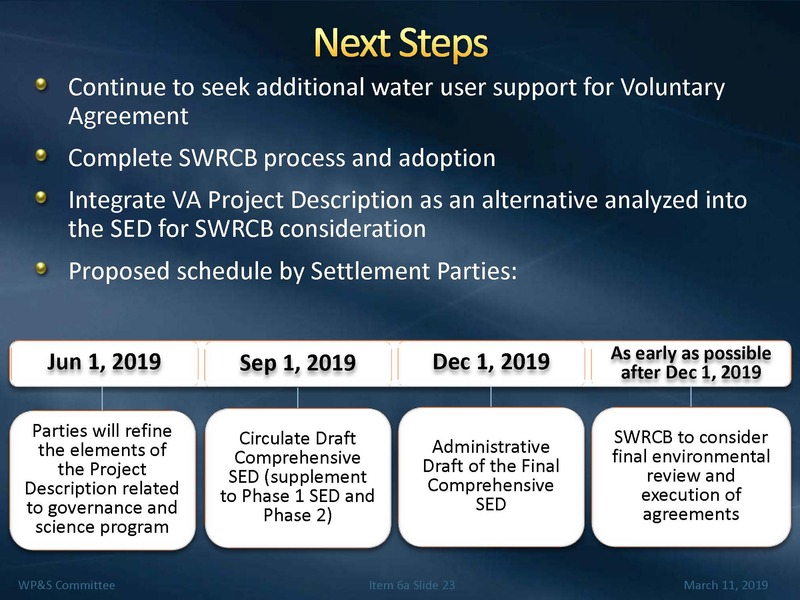 Mr. Arakawa’s presentation included a comparison of proposed flows in the voluntary agreement proposal to those being proposed by State Water Board staff, as well as a look at how the proposed actions would be funded. 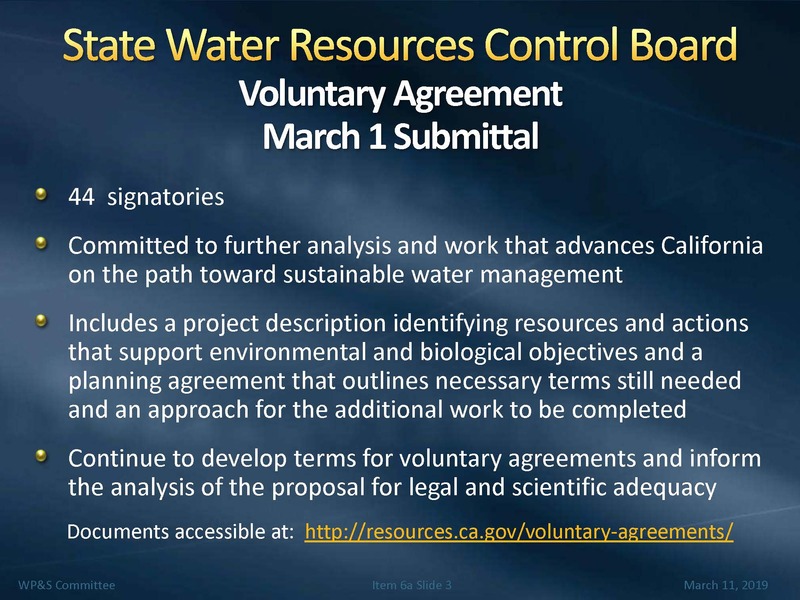 It’s also important to note that the proposal submitted to the State Water Board is not yet complete; it includes a planning agreement among the negotiating parties (water agencies, irrigation districts, NGOs) submitting the proposal that is an agreement to continue working out the details in hopes of reaching a final agreement (or in other words, a plan to continue planning). Mr. Arakawa began by noting that the State Water Board is responsible for setting water quality standards for the Delta watershed which is done through a water quality control plan. They also have responsibilities for establishing and administering water rights. 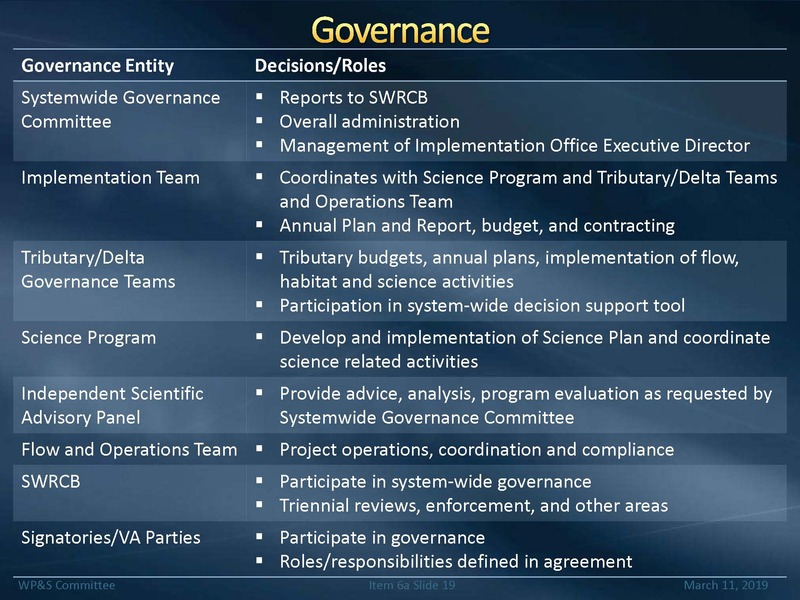 In setting water quality objectives, the State Water Board is charged with balancing among the different beneficial uses, such as fish and wildlife, and the consumptive needs for agricultural, municipal, and industrial uses in meeting water quality needs of the system. The Board is supposed to review the objectives every three years; however, the State Water Board has been in the process for nearly a decade now to review the most recent water quality control plan that was adopted in 2006. 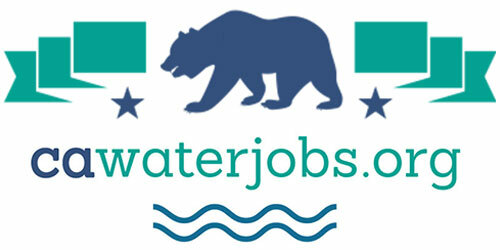 On March 1, 2019 the Department of Water Resources and the Department of Fish and Wildlife submitted a framework of a voluntary agreement currently being negotiated intended to be an alternative for the State Water Board’s update to the water quality control plan; the agreement would extend 15 years into the future. 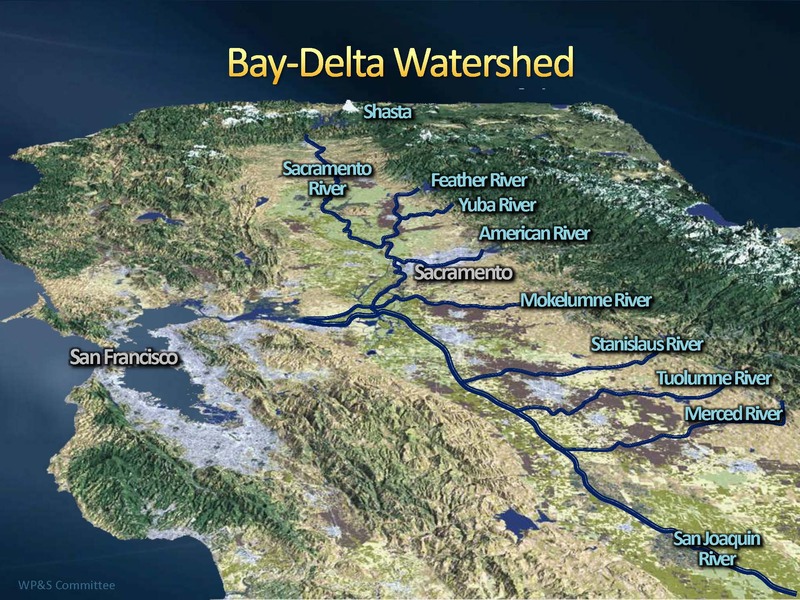 The state has been working on this for over two years, even calling in former Secretary of the Interior Bruce Babbitt who had successfully negotiated an agreement among NGOs and water users in 1994 known as the Bay Delta Accord that was then used by the State Water Board as a basis for adopting a water quality control plan in 1995. Mr. Arakawa noted that this is larger than that effort because it involves parties upstream as well as in-Delta and water exporters and is more integrated. The state submitted a project description of a proposal to protect the Delta watershed system in the tributary systems and the Delta along with the water and funding resources that would be committed, with the hope that the State Water Board will consider this as an alternative in their process as they make decisions on the water quality control plan. There were 44 signatories to the submittal which includes a project description identifying resources and actions that support environmental and biological objectives and a planning agreement that outlines necessary terms still needed and an approach for the additional work to be completed. 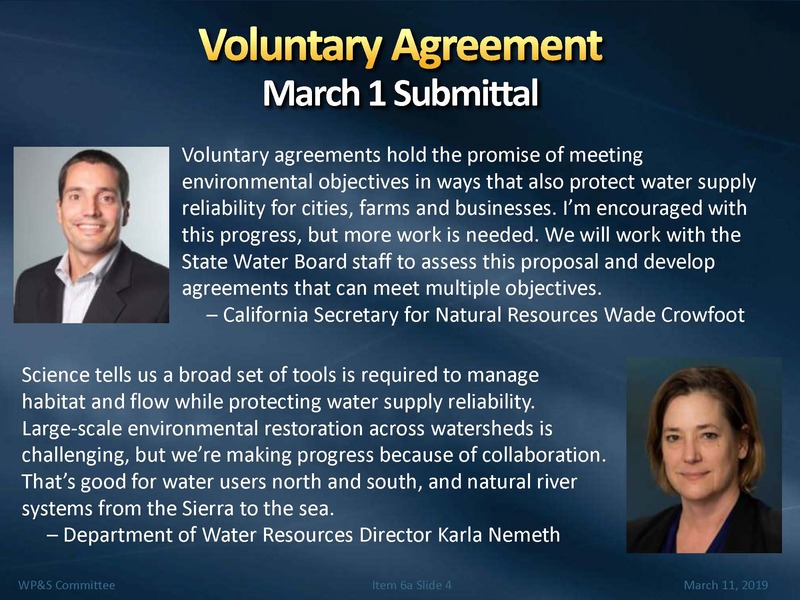 Secretary of Natural Resources Wade Crowfoot and Director of the Department of Water Resources Karla Nemeth both expressed support for moving forward on the broad approach being proposed by the voluntary agreements. Mr. Arakawa noted that the Delta watershed is large, encompassing the Sacramento River and its tributaries, the San Joaquin River and its tributaries, and their confluence in the Delta out to the San Francisco Bay, so it’s a broad geographic area to work with. 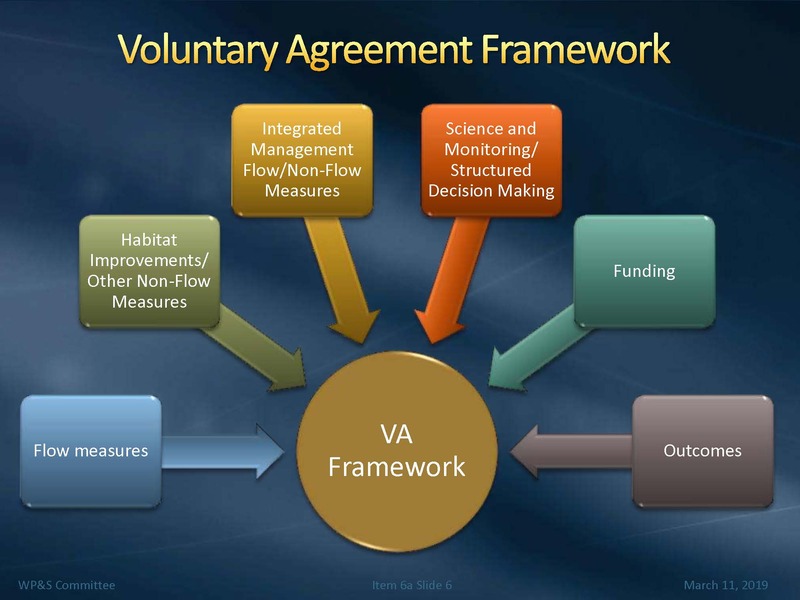 The voluntary agreement has six components: flow measures, habitat improvements, integrated management improvements, science and monitoring, funding, and then evaluation of outcomes with the ability to adjust as these actions are being implemented if necessary. 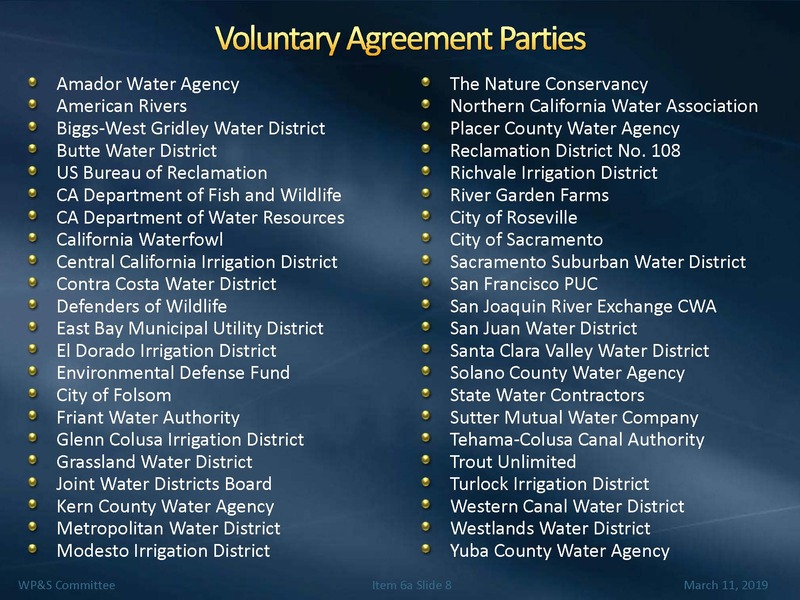 He presented a list of parties involved in the negotiations, noting that it includes the Sacramento Valley and key tributaries, as well as the US Bureau of Reclamation, Department of Water Resources, and the Department of Fish and Wildlife. DFW is involved in the process to identify what the needs are in the systems, the tributaries and in the Delta, so they are playing an important role. There are also non-governmental organizations that have been involved. He noted that there is not firm commitment from all the parties buying into the agreement, but they are willing to continue working together. He also acknowledged that some of the environmental groups involved have expressed their concerns that certain issues need to be addressed as this moves forward. A lot of documents have been produced leading up to the decision on the San Joaquin, including scientific basis reports and a Substitute Environmental Document, which is a CEQA-equivalent document for agencies undertaking regulatory actions. The Board has not yet released the draft Substitute Environmental Document for the Sacramento River, but one is expected by the end of the year, so how the Voluntary Agreement process moves forward is key to how the State Board will be considering all that, he said. 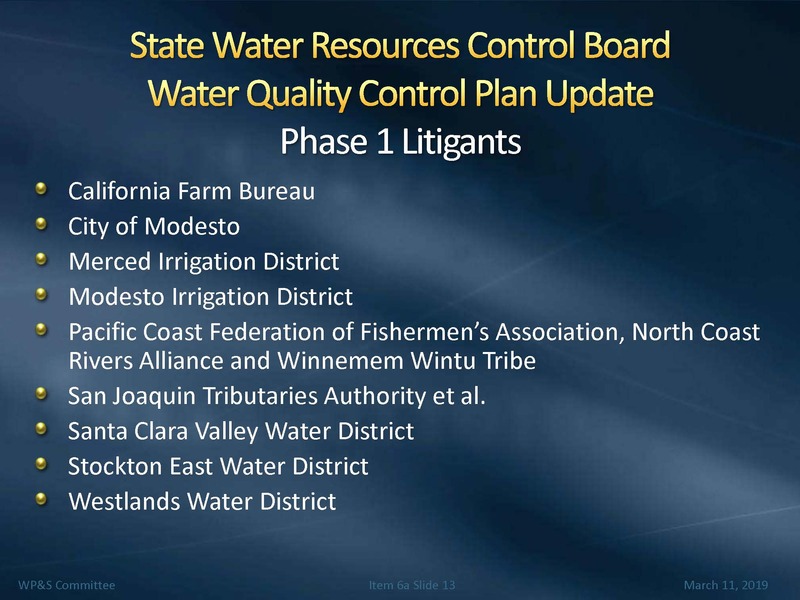 Mr. Arakawa then went through a series of slides to compare what is proposed in the Voluntary Agreements to what the staff’s proposal is for the update to the water quality control plan. He acknowledged that the Voluntary Agreement proposal is not yet complete and there really isn’t an exact comparison in some areas. 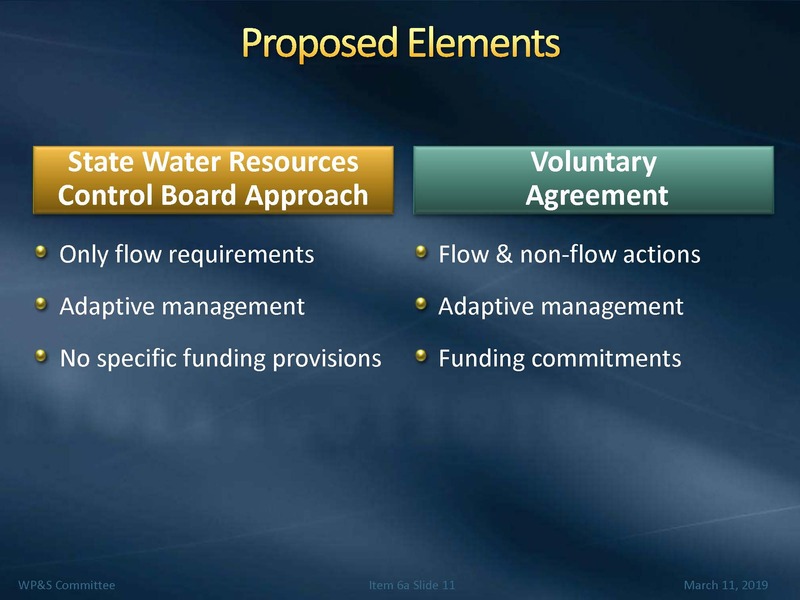 Essentially the staff proposal recommends flow requirements based on unimpaired flow and an adaptive management team to manage those flows; there’s no specific funding type of recommendations that are included, so the basic difference between the Voluntary Agreement and the State Water Board recommendation is the inclusion of the non-flow actions in the Voluntary Agreement and the funding commitments, he said. For the San Joaquin River and tributaries, staff recommended 40% of unimpaired flow amount, or in other words, of all of the water that’s available, 40% will be dedicated to flows mainly February through June; there is a range of 30-50% with 40% being the midpoint. An analysis estimated that it would reduce water deliveries by 300,000 acre-feet. 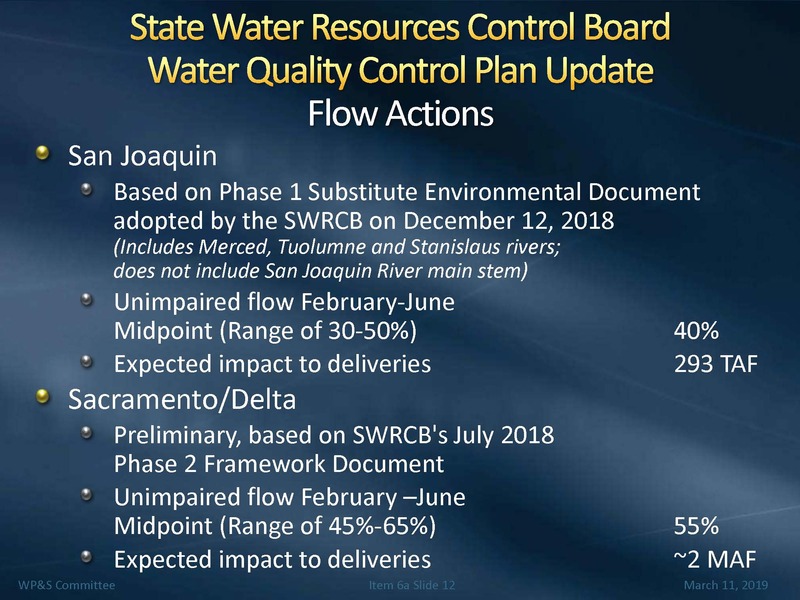 For the Sacramento River, staff has not yet completed the Substitute Environmental Document, but is recommending 55% with a range of 45%-65% of unimpaired flow which is estimated to reduce deliveries to water users on that system by 2 MAF, he said. Following the State Water Board vote on the San Joaquin tributary flow objectives on December 12, a number of parties filed lawsuits, including agencies along the San Joaquin as well as those that depend on that water, such as the Santa Clara Valley Water District, Westlands Water District, and the San Joaquin Tributaries Authority which includes the City and County of San Francisco. The Voluntary Agreement discussions have been oriented towards a commitment for a specified volume of water in the spring and summer of in above normal, below normal, dry, and even in some critical years, but not in wet years. The water would be made available by a variety of means, including fallowing of land, reservoir reoperation, some groundwater substitution, and export curtailment. 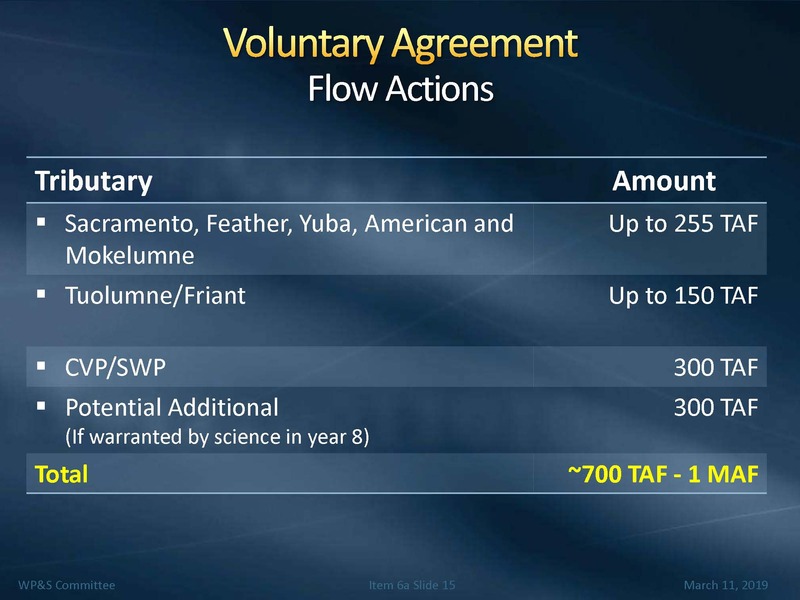 He presented a table of the Voluntary Agreement flow actions with a breakdown of how the flows would be contributed by the different tributary systems. 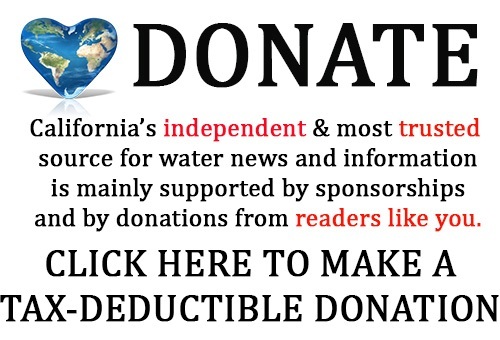 For the Sacramento, Feather, Yuba, American, and Mokelumne, up to 255,000 acre-feet of flows have been identified; for the Tuolumne and Friant, up to 150,000 acre-feet; and 300,000 acre-feet for the Central Valley Project and the State Water Project. An additional 300,000 acre-feet would be part of a science and experimentation process that would be determined by year 8 of the settlement whether up to that amount of water is justified. Overall, about 700,000 acre-feet up to 1 MAF of flow commitment through the Voluntary Agreement approach, he said. Mr. Arakawa reminded that the Voluntary Agreement is multi-faceted. “It includes habitat and other non-flow actions and I think that the water users and even the state recognizes that it’s the combination of the flow and the habitat that are going to reestablish certain estuarine functions, and so it’s important that it’s a combination of those two things, rather than just one or the other,” he said. The Voluntary Agreement includes 115 individual actions, both in the Delta and in the tributaries upstream; 87 of the actions are new and 28 were existing actions that the state is looking to expedite or accelerate. The types of projects include gravel and channel modification to improve habitat for fish migration and fish rearing, some in-Delta tidal wetlands, floodplains, channel banks, and aquatic weed control. The documents submitted describe a variety of projects, such as creating channel habitat at Bartons Bar on the Yuba River that would add riparian vegetation and create new side channels to improve the habitat; adding gravel and restoring native vegetation on the Tuolumne for salmon to spawn, incubate, and rear up in the river systems; in the Delta, some tidal habitat and some channel habitat along the Sacramento River, Steamboat Slough and Sutter Slough; and removing aquatic weeds in the Delta, trying to reduce predation for both smelt and salmon. These kinds of projects in the Delta could help winter run, spring run, green sturgeon, Delta smelt, and longfin smelt, he said. 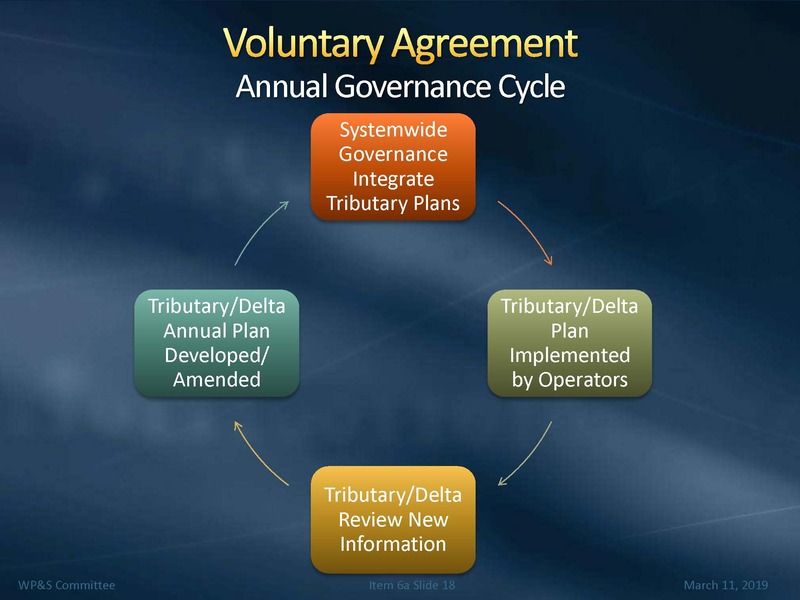 The Voluntary Agreement would have a system-wide governance process that would integrate the tributary groups into the Delta; annual plans would be developed; the operators would be coordinating on actions to operate the flow aspect of the programs; and then there would be an effort to review and assess and to update or adjust as needed, he said. 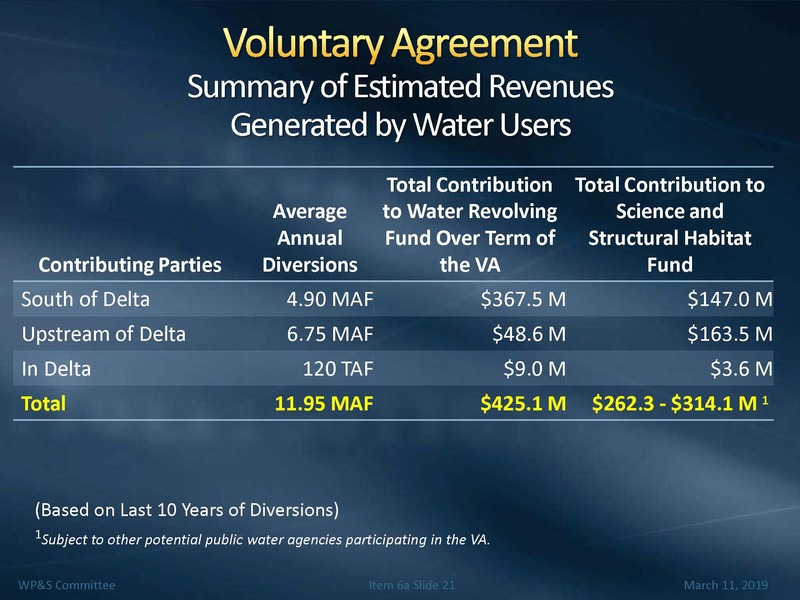 Based on the last ten years of diversions which is about 12 MAF, the estimated revenue amount was $425 million for water purchases and $262 million for the science and habitat fund. “The range is that there is the opportunity to bring in a broader group of parties into the agreement and if that was successful, that could be increased to about $314 million into the science and habitat fund,” he said. 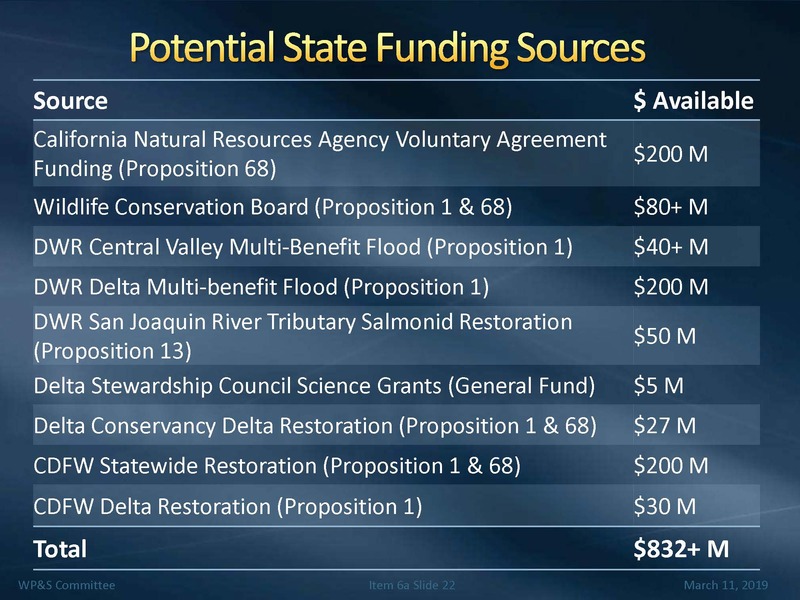 Potential state funding sources could come from Prop 68, Prop 1, and other bonds that have identified restoration and water purchase provisions; they have identified about $832 million that could be made available by using a combination of the provisions already in place and potentially repurposing some of them. He acknowledged that not all parties in the watershed are included and there is a variation between what’s in the State Water Board plan and what’s in the voluntary agreement, recognizing that not all parties are in the voluntary agreement, and lastly, the voluntary agreement has the habitat component in addition to the flow component, and the key is the combination of those two providing the protection. 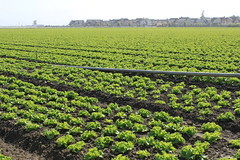 “But if water quality standards aren’t met, they would still have to back to the drawing board … ,” said Director Gold. “You definitely have to meet what’s necessary for the beneficial uses, there’s no dispute from me on that, so maybe as we get further into this, we can have another session on how that would work,” said Mr. Arakawa. Agenda, webcast, and meeting materials available by clicking here. 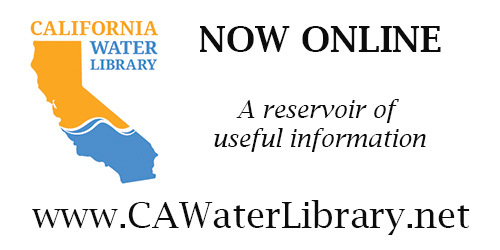 Click here for the voluntary settlement agreement documents submitted to the State Water Board.